Meret Oppenheim often explored one subject through a variety of mediums. A favorite theme was the legend of the eighth-century queen Genevieve of Brabant, who was unjustly accused of adultery and sentenced to death. After her executioner took pity on her and released her, Genevieve survived in a forest for six years, giving birth to a son. Found by her guilt-ridden husband, she was forgiven and taken back to the royal palace. Oppenheim invoked Genevieve in a poem from 1933; a painting, The Suffering of Genevieve (1939); and a wood sculpture, Genevieve (1971). The queen’s fate served as a metaphor for Oppenheim’s experiences from 1937 to 1954, when she suffered personal and creative crises. 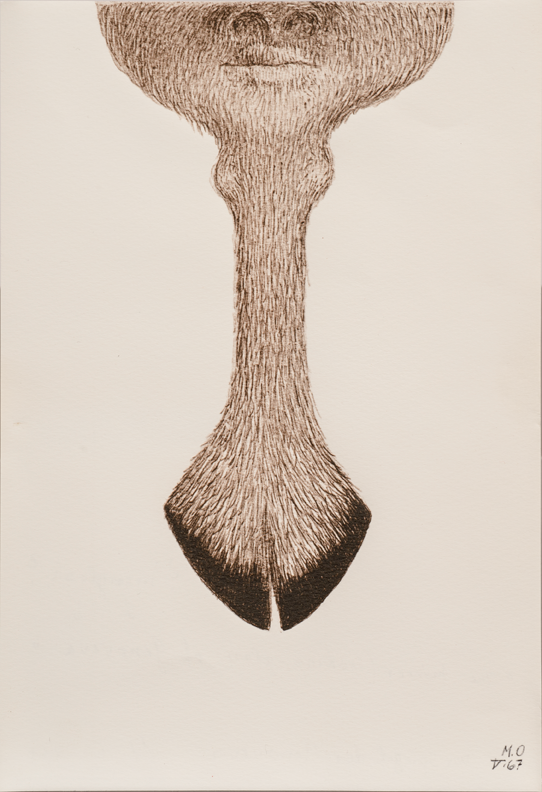 Rather than depict a beautiful queen in Genevieve’s Mirror, Oppenheim drew a hairy animal hoof and the lower part of a human face, joined to look like the handle of a portable mirror. The image may reflect Genevieve’s years living in the wilderness; according to legend, she and her infant son were fed with the milk of a doe. This entry was posted in Artist Spotlight, From the Collection, From the Curator, NMWA Exhibitions by Women in the arts. Bookmark the permalink. An arresting painting… based on the human condition… can be exquisite.